Researchers at the City University of Hong Kong have just achieved a first. 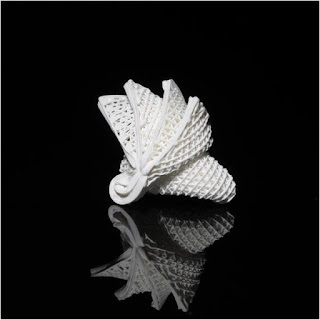 They're able to 4D print ceramics in large sizes with high strength and mechanical robustness. This tech may have very significant use in telecom, electronics and aerospace. The scientists developed a unique "ceramic ink". It's a mix of polymers and ceramic nanoparticles. They 3D printed with it and the objects created -"ceramic precursors" - are soft and can be stretched 3 times their shape and size. Being flexible and stretchable allows for complex shapes such as origami folding. The structures are also mechanically robust and strong. With heat treatment, they reconfigure into ceramics with complex shapes, making them 4D ceramics, like the (above) image of their Sydney Opera House. The research, led by City University of Hong Kong's Chair Professor of Mechanical Engineering Lv Jian, was just published in the journal Science Advances. 4D printing is 3D printing with the added Dimension of time. The object can reshape or self assemble itself over time with outside stimuli like magnetic fields, temperature or mechanical force. When the Hong Kong scientists' stretched ceramic precursors are released, they undergo self-reshaping. With heat they become ceramics. They can come in large sizes with high strength. The potential for this technology is for use in electronic devices for the new 5G network. It also holds potential for consumers who like working with ceramics. And for propulsion components in the aerospace industry for space exploration.